Not being able to see your favorite television show or read your favorite book can be devastating. But, there are steps you can take to continue to enjoy your beloved activities and perform everyday tasks even with vision loss. Dr. Laura Sperazza, director of low vision services at Lighthouse Guild says, "Low vision is permanent vision loss that cannot be improved with eyeglasses, contact lenses, medicine or surgery. However, new technologies and rehabilitation can make life easier and more fulfilling. The future may be brighter than you think." Get regular eye exams. If you've been having problems reading, writing, watching television, driving and participating in other common activities, it's important to get a comprehensive eye exam. An eye care professional can identify the cause of the problem, recommend steps to help you deal with your impaired vision, and avoid preventable vision loss. Put together a vision rehabilitation team. Identify people and organizations that can help you maximize use of your remaining vision. Your optometrist can help ensure that you know and use resources appropriately. Embrace Technology. 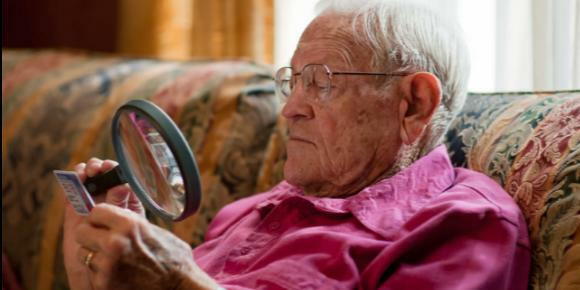 Low vision aids, magnifiers and telescopes can help you read and see objects more easily. There are many devices available such as talking watches, timers, blood sugar machines and blood pressure cuffs; large print reading materials; telephones, watches, remote controls, and thermostats with large digits and high-contrast colors. Tools such as needle threaders, tactile labels, and magnifying mirrors can be a big help. Electronic devices including video magnifiers; audio books; electronic books; smartphones, and tablets that enable you to change the font size can make life easier. And, low vision apps for cell phones, tablets and computers that can read aloud or magnify what is on the screen can make all the difference. Make Simple Adjustments. Most people benefit from increased lighting, improving contrast and decreasing glare. Increase the light in your home with brighter bulbs. Reduce outdoor glare by wearing wrap-around sunglasses and wide-brimmed hats. Use brightly colored items in your home to create more contrast, use heavy markers to make shopping lists that you can read more easily while shopping. Dr. Sperazza says, "With the help of a supportive eye care team and vision rehabilitation, living with low vision can be less challenging."